The first release in Deutsche Grammophon’s new partnership with the Verbier Festival that will see the release of exceptional concerts with great artists (2 sets per year from 2016) recorded by Verbier over the years. 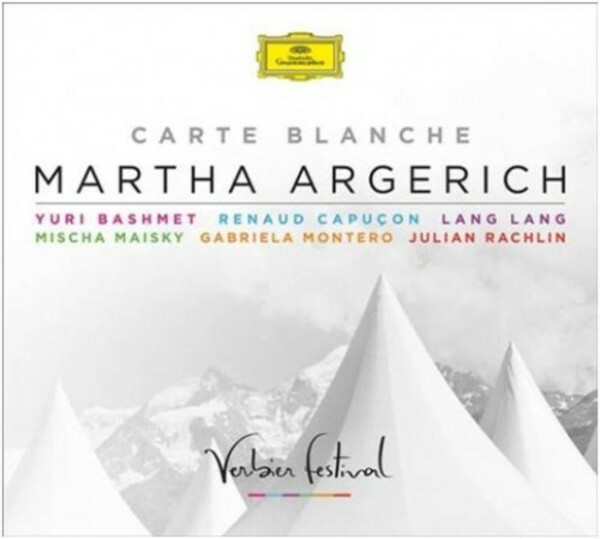 Something special was bound to happen when Martha Argerich was given carte blanche to invite whoever she wanted, to play whatever she and they chose at her Verbier Festival concert on 27 July 2007. She was the life and soul of the party, playing in seven works and making a rare solo appearance in Schumann’s Kinderszenen. Argerich’s artistic partners are Yuri Bashmet, Renaud Capuçon, Lang Lang, Mischa Maisky, Gabriela Montero and Julian Rachlin, in a killer programme. An uproarious encore was given by Gabriela Montero improvising a tango version of “Happy Birthday” (for Mischa Maisky’s daughter Lily Maisky). This release offers over two hours of exceptional music-making with an enviable line-up of colleagues.